Maine is facing a nursing shortage. UMaine unveils its plan to help. 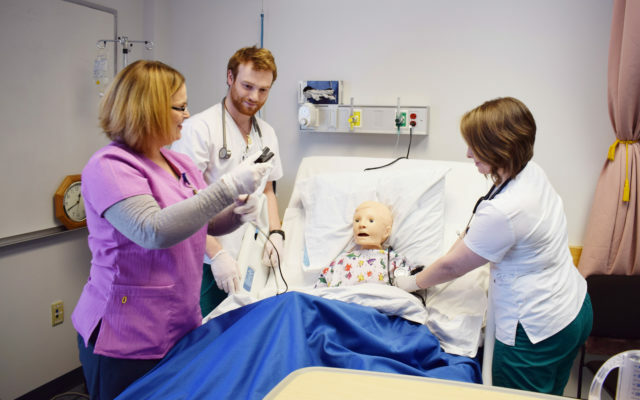 The University of Maine system unveiled a wide-reaching plan Wednesday to double its nursing enrollment over the next five years, which includes adding 1,000 new slots for students wishing to pursue a nursing degree online. The move is an effort to combat what health care leaders are calling an impending workforce crisis. Health care leaders are working to attract 250 new nurses to Maine, and are partnering with the state’s colleges and universities to graduate an additional 400 license-eligible nursing students each year to counteract 3,200 vacant nursing positions expected across the state by 2025, a deficit that will hit hardest in rural Maine, Chancellor James Page said Wednesday. Page, along with other presidents of the university’s seven campuses, announced Maine’s five-year plan at the Maine Council on Aging’s annual summit in Augusta. Tactics the university will pursue include growing the system’s online nursing enrollment capacity to appeal to new students in rural Maine; covering tuition and some fees for new, first-degree nursing students who qualify for the federal Pell Grant at the Augusta, Fort Kent and Presque Isle campuses; and launching a new, accelerated second-degree Bachelor of Science in Nursing degree in Machias. To read the rest of “Maine is facing a nursing shortage. UMaine unveils its plan to help.,” an article by contributing Bangor Daily News staff writer Alex Acquisto, please follow this link to the BDN online.